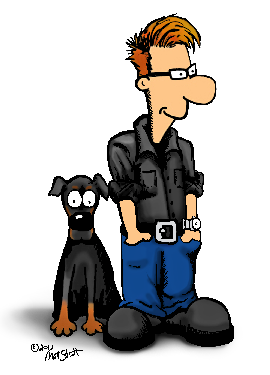 This is the official home of Mesy Comics and virtual home of its creator Matt Strott (that’s me). It’s the primary site for showcasing some of the comics, illustrations and graphic design I’ve created over the years. Mesy (Pronounced Messy) Comics is largely a figment of my imagination: an exercise in absurdity. First and foremost, it’s the creative outlet for a guy who loves cartoons and comic books. It’s the self-publishing and freelance company for cartoonist and graphic designer Matt Strott. The full story of Mesy Comics spans several decades. If you are having trouble sleeping and would like to read more check out the About Mesy Comics page. Otherwise, MesyComics.com is a pretty straight-forward gallery. Just click on the menu tabs above to navigate to the art you’d like to see. P.S. Like most art, the site is a work in progress. Please check back soon for more updates. In the meantime, I hope you enjoy the “The Last Resort” and other comics found on my blog.